Fall River, MA – For the third consecutive year, Saint Anne’s Hospital has been named one of America’s Best Hospitals for Orthopedics by the Women’s Choice Award®, America’s trusted referral source for the best in healthcare. The Women’s Choice Award for orthopedics is the only award that recognizes excellence in orthopedics based on robust criteria that consider both patient satisfaction and clinical excellence. Saint Anne’s is one of 484 Women’s Choice Award recipients representing U.S. hospitals that have met the highest standards for orthopedics care. The award signifies that Saint Anne’s Hospital is in the top 10% of 4,797 U.S. hospitals offering orthopedics services. According to a study reported in The Journal of the American Academy of Orthopaedic Surgeons, there are clear gender differences in musculoskeletal disease. Structural anatomy differences, hormones, and genetics are factors in optimizing care for male vs. female orthopedic patients. Because women have higher rates of arthritis than men, some 60% of joint replacement surgeries are performed on women. In a national survey conducted by the Women’s Choice Award, female orthopedic patients identified key priorities when choosing a hospital for orthopedics, including single source for orthopedic services; a solid patient safety record; and high recommendation ratings. The methodology used to select Saint Anne’s Hospital as one of America’s Best Hospitals for Orthopedics is unique because it evaluates Hospital Consumer Assessment of Healthcare Providers and Systems survey results along with primary research about women’s healthcare preferences. A hospital must have arthroscopy, joint replacement and spine surgery orthopedic services available to patients, onsite physical therapy, and an MRI in order to qualify for the award. Award recipients are also measured on their incidence of surgical complications and infections, including such things as the rate of complications for knee or hip replacement patients; catheter-associated urinary tract infections; and methicillin-resistant Staphylococcus aureus (MRSA) infections. “The Women’s Choice Award for Orthopedics is distinctive,” said Michael Bushell, Saint Anne’s Hospital president, “because it not only evaluates how well patients do clinically after joint replacement, but how satisfied patients are with their experience. For more information on the America’s Best Hospitals for Orthopedics, visit https://www.womenschoiceaward.com/awarded/healthcare. A member of Steward Health Care, Saint Anne’s provides nationally recognized patient- and family-centered inpatient care and outpatient clinical services to patients from surrounding Massachusetts and Rhode Island communities. Saint Anne’s has earned the Leapfrog Group’s “Straight A’s” grade for patient safety since the award’s inception in 2012 and, for two consecutive years, has been named a Top Hospital in the U.S. by The Leapfrog Group for quality and safety. In addition Saint Anne’s was the only hospital in Massachusetts and Rhode Island in 2018 to have earned Healthgrades’ dual Patient Safety Excellence Award™ and Outstanding Patient Experience Award™. In addition to orthopedics, the hospital’s key services include surgical services, including multiple robotic-assisted surgical capabilities, two ambulatory surgery centers, spine surgery, and bariatric surgery; Saint Anne’s Hospital Regional Cancer Center; the Center for Pain Management; the Spine Center; and inpatient geriatric psychiatry services. To learn more, visit https://www.saintanneshospital.org. 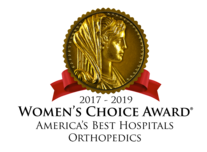 The Women’s Choice Award® is a trusted referral source, empowering women to make smart healthcare choices by identifying the country’s best healthcare institutions based on robust criteria that consider female patient satisfaction and clinical excellence. The Women’s Choice Award has been honored by the INC 5000 List of America’s Fastest-Growing Private Companies for three consecutive years. To learn more, visit http://www.womenschoiceaward.com.